The Spanish word “pasatiempo” is translated as “hobby” or “pastime” or a “relaxed passage of time.” Over the years, golfers have argued that there are few places more breathtaking and challenging than the course named Pasatiempo built by Marion Hollins and Dr. Alister MacKenzie. 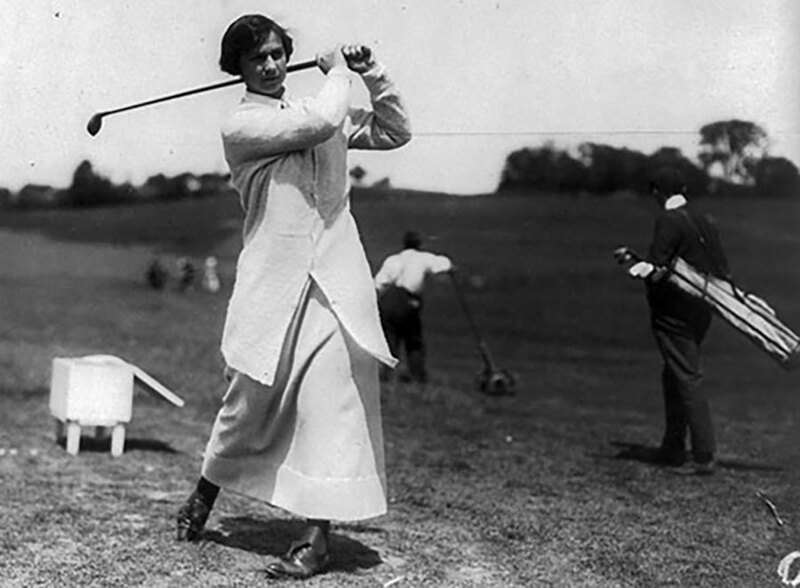 Marion Hollins was the U.S. Women’s Amateur Champion in 1921, and is widely recognized as pioneer of international womens sports at a time when sports were considered primarily a male activity. Ms. Hollins was an expert equestrian rider, and the only woman in America with a men’s handicap in polo. She was a also a female entrepreneur in a man’s world, a dreamer and a doer, a business associate of the rich and famous, and a person who made and lost fortunes. While working for Samuel B. Morse at the Pebble Beach Company, Marion Hollins was given the task of developing the Cypress Point Golf Club. A great student of the game, she brought the teaching pro, Ernest Jones, to America and Dr. Alister MacKenzie to Cypress Point. Dr. MacKenzie gives her credit for the location of the 16th hole at Cypress. She teed up a ball and drove to the middle site for the suggested green. On January 12, 1928, Marion announced she would begin work on a real estate and sports facility consisting of: an 18 hole championship golf course, clubhouse, swimming pool, tennis courts, steeplechase course, bridal paths and a beach club on the Monterey Bay. For the design of the golf course, she secured the services of Dr. MacKenzie. Her goal was to build the best course west of the Mississippi and the result of their efforts is Pasatiempo Golf Club. The location of the golf course was on the hills looking south to the Monterey Bay. The rolling hills of sand made an excellent foundation for the course and the elevation changes provided a natural resource for Dr. MacKenzie to develop his Santa Cruz masterpiece. 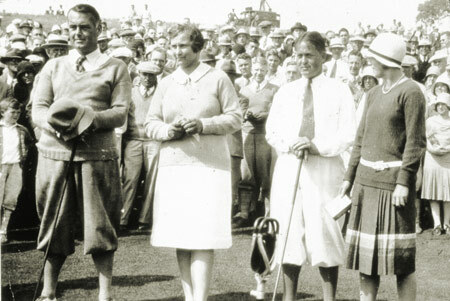 The course officially opened on September 8, 1929, with the first group to play consisting of Marion Hollins, Bobby Jones (considered the father of modern golf), Glenna Collett (U.S. Womens Amateur Champion) and Cyril Tolley (British Amateur Champion). Over 2,000 spectators gathered for the grand opening and followed this world-class foursome around the course. The photo at top is Marion Hollins teeing off the fourth hole on Opening Day and includes a select who’s who of golf in the 1920s. 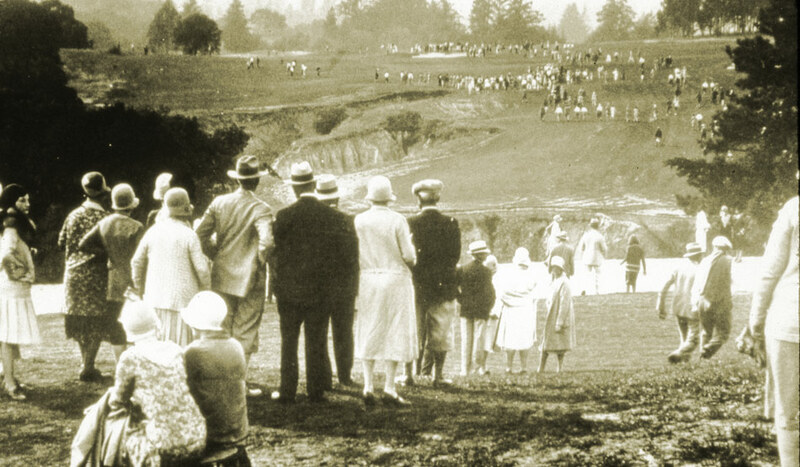 Besides Pasatiempo’s first foursome, some of the other golf celebrities of the era attending the Opening were Alister MacKenzie, Ernest Jones, and Grantland Rice.